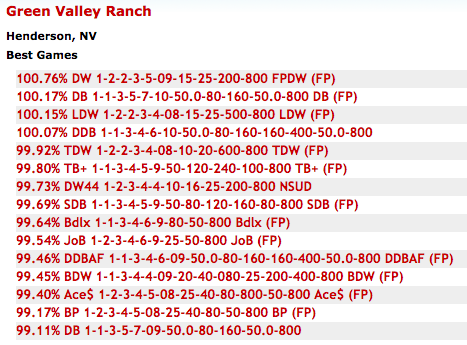 Before I stay at a casino for the first time I always check the video poker pay tables. I usually take trips like this by myself so I end up playing a lot of video poker. I’m usually happy playing 9/6 Jacks or Better or 8/5 Bonus Poker but I think I’ll change it up a little for this trip. I think I’ll take a stab at the 100%+ returns for a change. There are 4 different games on 15 machines so they should be somewhat easy to get on. I’ll probably dabble in the 10/7 Double Bonus Poker game since the strategy isn’t too difficult. The worst case scenario (and it’s not bad at all) is that I sit at the sportsbook bar playing 8/5 Bonus Poker. Oh, the horror. There may not be a secret to finding a Royal Flush, but if you keep your eyes open you may find one. Red Rock Resort is one of three casinos in my neighborhood but its my favorite. You might know that I consider the sportsbook bar my local bar. If you follow me on twitter you probably know that I’m at Red Rock a few times a week to work, eat, drink and gamble (WEDGeVegas?). I’ve been in a rut playing video poker over the past year. I play mostly full pay quarter, fifty cent or $1 Jacks or Better or Bonus Poker and hadn’t seen a Royal Flush in quite a while until recently. 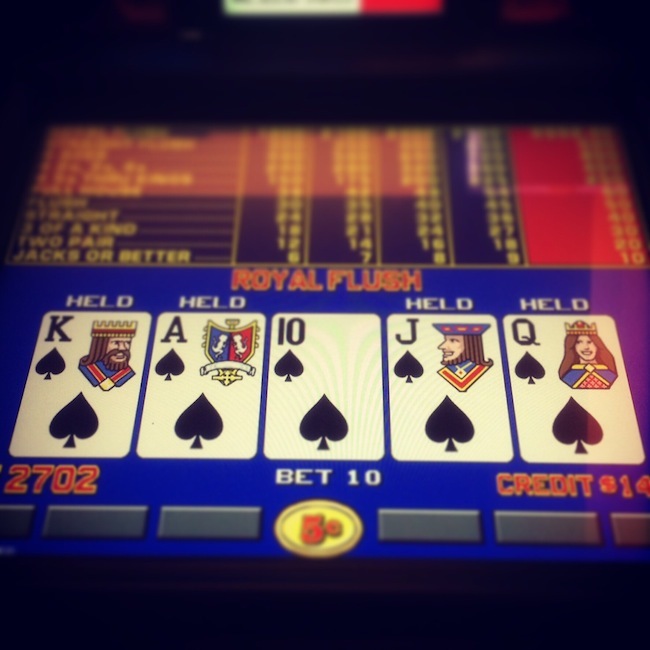 Over the summer I began playing nickel video poker games just so I could say I got a Royal Flush with hopes that it would help get my mojo back. 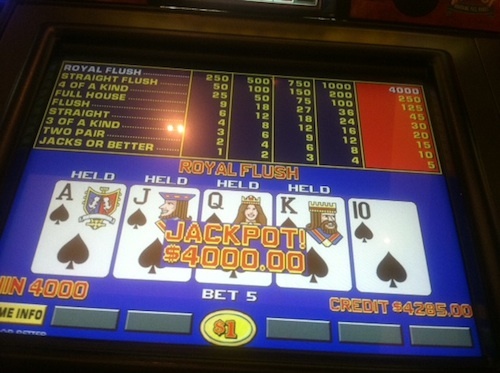 After a few sessions at various nickel machines I finally got a sweet Royal Flush. Then I got another. Then I got another. These were nickel games but were still the Royal Flush that I wanted. My video poker mojo is back and I’m back to playing my normal denominations for the most part. I’m back to playing video poker with my normal denominations for the most part. However, when I walk by this specific bank of nickel video poker machines and see the progressive is above $525 I’ll always put in a $20 bill. The jackpot never reaches $600 so there’s a good chance that maybe I’ll cash in on a Royal Flush for $20. Since I started doing this a few months ago I’ve hit three progressive Royal Flush jackpots of $525 or more. When you have a casino that you frequent more often then others, no matter where you live, you notice things most people don’t. In my case it’s a bank of nickel progressive video poker machines right across from Starbucks. My typical visit usually has me in this area so I usually check out this progressive jackpot when I visit. I first noticed a bank of slot machines that hit progressive jackpots in a similar manner back at Showboat in Atlantic City when I lived on the east coast. I’ve kept my eye open for progressives as well as “lucky machines” even since. You may not want to bring a note pad with you when you visit the casino to mark where you’re playing but you might want to keep a mental note. It could pay off. I don’t like lines. I don’t do lines. If a business wants me to wait I’ll usually take my money elsewhere. That’s how I roll. I think SLS Las Vegas understands people like me. Since SLS Las Vegas is still new the lines for the players club have been extremely long. Here’s how skip the lines to sign up for their players club, The Code. You can sign up at any table game, video poker or slot machine or the cashier. 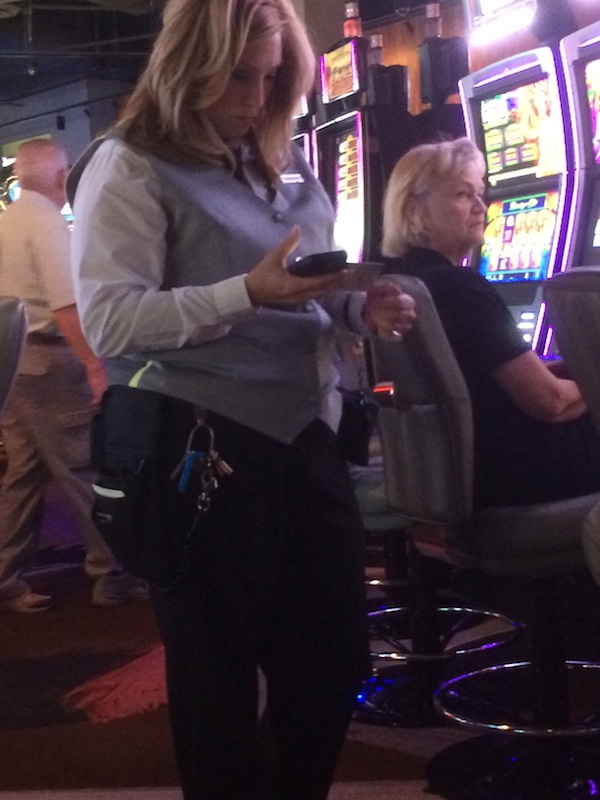 There are constantly SLS reps walking the casino floor looking to sign new players up for The Code. It’s very convenient. I signed up for The Code online before visiting and getting a card took about 1 minute at the cashier’s cage while they verified my information. Nice n smooth. This isn’t a new concept. You can get a players club card at table games at most casinos. Some properties have rovers around the machine games like SLS to make you a card on the spot too. I just figured I’d give you a heads up in case you weren’t aware of these tricks. There’s nothing worse than wasting time in lines in Vegas. It’s been a while since I did a video poker check but since SLS Las Vegas is new and is supposed to have good video poker games I figured that I’d take a look. 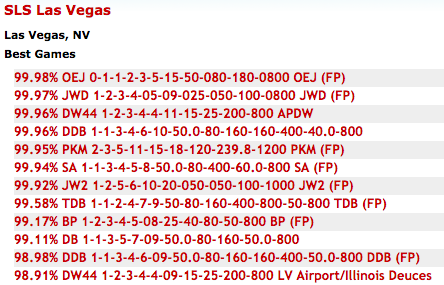 On first glance there are some really good video poker options available at SLS Las Vegas according to vpFREE2. When you look deeper into the pay tables you’ll see that most of the best video poker games at SLS Las Vegas are available on just 4 video poker machines. The best 8 video poker games are only available on these 4 low limits video poker machines (5¢, 10¢, 25¢) located between Sayers Club and Sportsbook Bar along the aisle. Bonus Poker and the games below it on the chart above are available throughout the casino. You can see specific locations and denominations on vpFREE2.com. I’m personally happy that there is 8/5 Bonus Poker available. That’s my second favorite video poker game. I don’t mind that the single games are $1 and up or that the 3-play games are 25¢ but it would be nice if they had some one line quarter games available. Overall SLS Las Vegas has a good selection of video poker for the Vegas Strip but it isn’t better than many Downtown Vegas or Off-Strip casinos. More on SLS Las Vegas and locals later this week or early next week.